The Lady with an Ermine. It is well documented that Leonardo did paint a portrait of Ludovico Maria Sforza’s mistress Cecelia Gallerani now famously known as ‘The Lady with an Ermine’. From the tender age of ten, Cecelia had been betrothed to Giovanni Stefano Visconti but the payments of her dowry had not been met and the vows of the couple were dissolved. In 1489 Ludovico took Cecelia as his mistress, she was about fifteen years old and remained as his lover for the next ten years. A clever, accomplished and well-educated individual, Cecelia was also a fine writer and poet. Leonardo’s portrait of Cecilia is (like da Vinci’s later painting La Belle Ferronniere) a magnificently realised study of feminine beauty. That’s not a statement that I make lightly, after seeing this picture at the Leonardo exhibition in London (2012) I bought a copy which now has pride of place on my wall. The Lady with an Ermine 1489/90. Oil on wood panel, 21x15 inches 54x39 cm. In this painting, Cecelia looks out from the picture over her shoulder to her left. This opposition of the body and head creates a slight twisting motion. 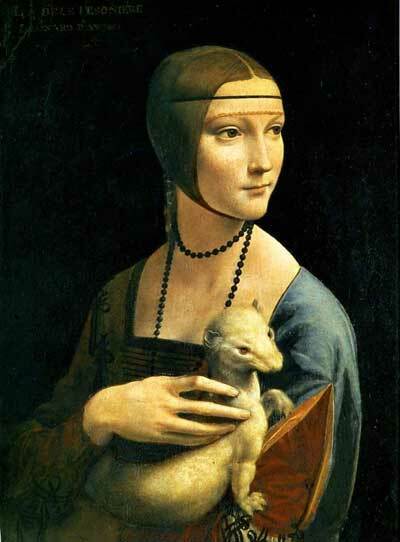 Leonardo has further emphasised this movement with his representation of the ermine. By repeating the twist of the head in the animal, he has mirrored the movement of the young woman. Cecelia’s hair is centre parted, falling on either side of the head and then braided in a cloth tied under the chin. The thin, black band around her forehead holds a transparent veil in place, she wears a Spanish style dress, popular at the time. The ermine (the name for the winter coat of the stoat) is reproduced here larger than life. A symbol of virtue and purity the ermine also alludes to Ludovico Cecelia’s lover, who, in 1486, had been presented with the Order of the Ermine by King Ferrante of Naples. Leonardo uses the device of the sitter emerging from a dark background illuminating the face, hand, and Ermine in stark contrast to the gloomy surroundings. These devices are not a product of trial and error, Leonardo had studied the effects of light falling on objects and applied this knowledge to his paintings. "what's going on over there? " The 'struggling stoat' also appears interested in whatever is happening out of the viewer's sight and, I often wonder about Cecilia's fingers!! Are they really so thin? Just elongated skin and bone. With an artist as talented as Leonardo da Vinci we have to assume that he painted them true to life... So it would seem that Cecilia had rather odd fingers. Leonardo also painted a portrait of Ludovico's second mistress, Lucrezia Crivelli, La Belle Ferroniere.